"ByuN" Hyun Woo took home just under $US35,000 ($46,400) after winning the GSL (Global StarCraft League) Season 2 finals earlier today in South Korea. You can watch him almost completely dominate his hot-shot opponent, Kim "sOs" Yoo Jin, across five separate matches below. The technologically advanced Protoss, helmed by sOs, took on ByuN's brutish space marine Terrans but were eventually overwhelmed. After some flashes of brilliance that won sOs the first match, ByuN's composure and speed left sOs outclassed and unable to regain a foothold for the rest of the series in a shockingly lopsided upset. 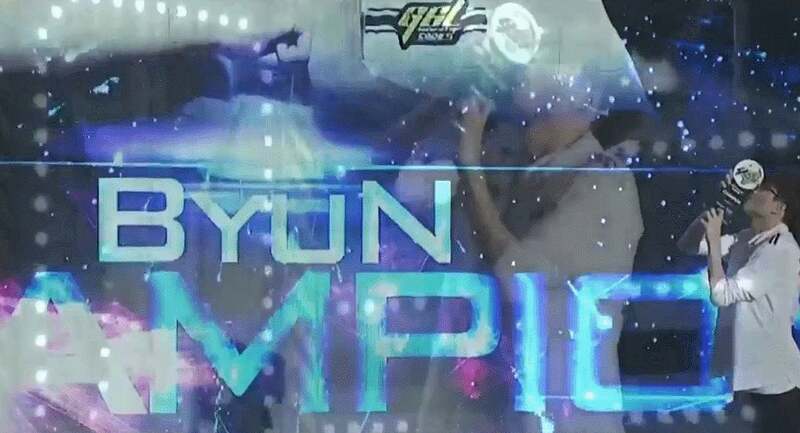 It marks ByuN as the only player to win Premier Korean League in both StarCraft and StarCraft II while being teamless and a force to be reckoned with heading into the World Championship Series at Blizzcon this fall. sOs fought the moment Combat Shields finished. He was confident; he saw no shields. StarCraft games can be won or lost in that one second. Unlike Street Fighter, which updates more frequently, or more recent esports like Dota 2 and League of Legends, there's something refreshingly archaic about StarCraft II. The way units twitch and fidget in ungainly formations prior to large battles feels intimate, as if the algorithms making up the game are bursting at the seams under the weight of its ageing legacy. It's kind of like watching a sprawling chess match between buckets of rusty nails and screws. The beauty of the chaos is in how deftly pro players like ByuN and sOs are able to manage it. Former World Chess Champion Garry Kasparov argued that no esport has the strategic purity to become as timeless as chess. But that's not really the point. The basic rules of chess have remained unchanged for centuries while annual patches can turn something like League of Legends completely inside out. With many esports, ephemerality is a virtue rather than a vice. And while games like StarCraft II have already fallen in popularity as they have aged and the scene around them has started to moved on, they still have the capacity to shock and excite. That's what happened earlier today when ByuN managed to take down the two-time WCS winner, sOs. And all this after practically vanishing from the pro StarCraft II circuit for nearly two years. You can find more information on the current standings heading into this year's Global Finals over at Blizzard.